Prior to every Yom Haatzmaut (Israel Independence Day), Israel commemorates Memorial day in memory of her fallen soldiers and the victims of terror. During the early hours of the day a siren is sounded through the land. It is heard in every city and every village, on every highway and in every field. When the siren is sounded every-thing is brought to a standstill. Cars cease to move, trains come to a halt and people, young and old, stand at attention. It is a very powerful and moving moment. During today's siren, I was standing at the western wall plaza. I stood close to the memorial flame built in mem-ory of those that have fallen. As the siren began I saw two groups standing close to the memorial at full attention. One group was the I.D.F. Honour guard. Next to them stood the other group, standing in unmoving attention as well. 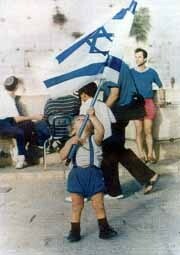 It was a group of kindergarten students from the local religious school dressed in the blue and white of the flag. One of the little girls was mouthing silently the words of one of the Psalms while another little boy saluted. One of the young children was tightly holding the hand of his teacher as she stood weeping. I realized that these two groups represented the true watchmen that G-D has placed on this earth to watch over these people... the soldiers of Israel's defence forces and the young children, the promise of the future. The memory of all those that have fallen in the defence of, or in the name of the Jewish people was being truly blessed by the presence of these two groups.